Daddy had a tattoo on his arm of a girl in a two-piece swimsuit. He got it when he was in the Navy during World War II, which I think is before they called them bikinis. He talked about how a very large island woman had done the tattoo while he was very drunk on jungle juice. He also said that in its original form, the woman had been naked. Before he was due to come home to Arkansas and his church-going, Sunday School-teaching Southern Baptist mother, he had to go get her swimsuit put on. He said that the swimsuit part of the tattoo, applied when he was stone-cold sober, hurt a lot worse than the initial naked woman part. If asked, he would flex his bicep so she would wiggle a little bit. Daddy also had small scraps of shrapnel imbedded under his skin on his arms and legs. I asked him why he had never had them removed. He said that at the time, the bits of metal had been so hot that they cauterized and sealed the wounds on their way in. Since there was little chance of infection, medical care was reserved for those boys whose wounds were much more serious than Daddy’s had been. Daddy didn’t talk much about his time in the service. One time I asked him about it, and he talked about how he was just a kid, and all the other boys were just kids, too – on both sides of the fight. He talked about the drinking water on board ship being sea water that was put through water treatment to make it drinkable, but that it still tasted brackish. He said it was very hard to drink that water knowing how many young men had died in the ocean it was pulled from. He talked about a Japanese ship that was sunk near his ship, and seeing the Japanese boys in the water. He remembered one in particular because a crewmate standing beside Daddy had pointed a rifle at the Japanese boy in the water, and the Japanese boy raised his hands and went underwater, never coming up again. Daddy figured he inhaled as he went down, preferring dying there to being captured. Daddy’s crewmate laughed about it; I don’t think it ever struck Daddy as being all that funny. The only other thing I remember Daddy mentioning was being stationed off the coast of New Zealand for eighteen months during his tour of duty. Mutton was the only meat available for restocking the ship’s larders, and so they had mutton at every meal. The only time I ever remember Mama cooking lamb chops was one time when Daddy was out of town. I didn’t much care for lamb, either. 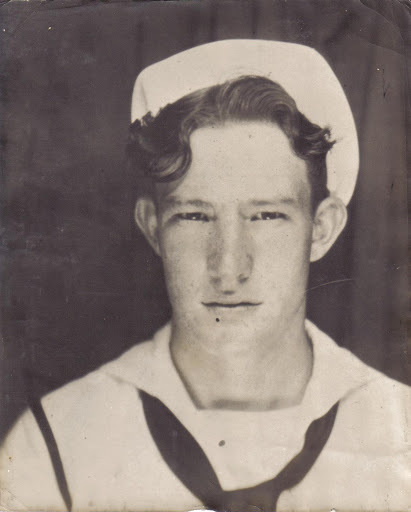 After Daddy passed away, my brother told me about how one of the ships Daddy served on had been sunk by torpedoes, and how Daddy had spent two or three days in the water, surrounded by pieces of his ship and dead crewmates. Daddy never told me about that part.